One of the most common misconceptions about pork is that it needs to be cooked well-done. For quite a few decades, it was common practice to cook pork to a minimum internal temperature of 160 F. The slightest trace of pink in a grilled pork chop or roasted pork loin was cause for alarm. Generations of people grew up wholly unaware that pork could be served in any way other than overcooked. It's the only way they'd ever tasted it. A pork loin roasted to 160 F is going to be tough, dry, and thoroughly flavorless. The good news is, it doesn't have to be that way. Why do so many people learn to cook the pink out of their pork? It all started with a parasitic worm called Trichinella. Fairly prevalent in pork in the 1930s and '40s, trichinella caused a particularly unpleasant and sometimes fatal disease called trichinosis. To combat it, the government urged people to cook their pork to 160 F, which would kill the parasite. As it turns out, 160 F was overkill. The trichinella worm is actually killed at 137 F. For all those years, people had been drastically overcooking pork for no good reason at all. In later decades, stricter laws governing the ways pork can be raised and handled helped drive the prevalence of trichinella way down, to the point whereby the mid-1990s it had been nearly completely eradicated. Modern pork is much leaner (less fatty) than it was in decades past, making it much more prone to drying out if it's overcooked. Even so, people kept right on cooking their pork to 160 F, despite the fact that 160 F was always too high and trichinella had been wiped out in any case. It was just the way they'd always been told to cook pork. Additionally, the USDA continued to recommend cooking pork to a minimum internal temperature of 160 F.
In 2011, the USDA updated their recommendations. The USDA now lists 145 F as its recommended safe minimum cooking temperature for fresh pork. This cooks pork to medium as opposed to well-done. A pork loin cooked to 145 F might look a little bit pink in the middle, but that's perfectly all right. In fact, it's great. Some intrepid souls, in search of ever more tenderness and juiciness, might even dare for 135 F to 140 F. But even if you stick to 145 F, your pork is going to be lifetimes more tender, juicy and flavorful than you've ever tasted before. A great tool to help you stay on top of your temperatures is a digital probe thermometer that can be set to alert you when the meat reaches its target temperature. 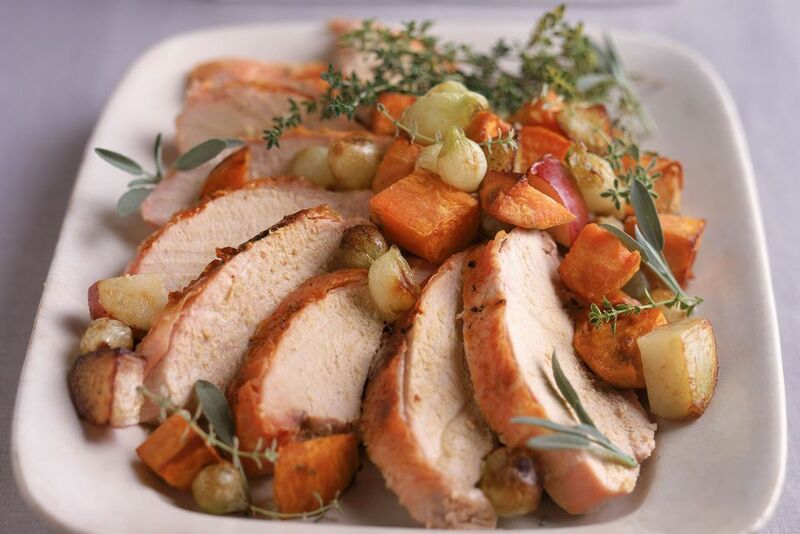 Because of something called "carry-over cooking," you have to remove your pork roast from the oven when its actual temperature is 5 to 10 degrees below its target temperature. The meat's internal temperature will continue to increase for a while, even after you take it out of the oven. The bigger the piece of meat and the higher your cooking temperature, the greater this effect will be. One last note: The USDA's new guidelines only apply to whole pork cuts like chops, roasts and so on. Ground pork, like all ground meats, still needs to be cooked to 160 F. Now get out there and enjoy some juicy pork roasts and chops.